FOR IMMEDIATE RELEASE – GREENWICH, CT, July 14, 2014 – Chief Executive magazine today announced that Bob Iger, CEO of The Walt Disney Company, has been named “2014 CEO of the Year,” an honor bestowed upon an outstanding corporate leader, nominated and selected by a group of CEO peers. This is the 29th year the award has been given, with past honorees including Bill Gates, former CEO of Microsoft, Jack Welch, former CEO of GE and Michael Dell, founder, chairman and CEO of Dell Computers. The 2014 CEO of the Year Selection Committee was comprised of: David Cote, Chairman and CEO, Honeywell, and 2013 Chief Executive of the Year; Dan Glaser, President and CEO, Marsh & McLennan; Fred Hassan, chairman, Zx Pharma and partner/managing director, Healthcare at Warburg Pincus; Tamara Lundgren, President and CEO, Schnitzer Steel Industries; Tom Quinlan, President and CEO, RR Donnelley; Christine Jacobs, former chairman and CEO, Theragenics, and director, McKesson; Bob Nardelli, CEO, XLR-8, Bill Nuti, Chairman and CEO, NCR’ Jeff Sonnenfeld, President and CEO, Chief Executive Leadership Institute, Yale School of Management; Mark Weinberger, Chairman and CEO, EY; Maggie Wilderotter, Chairman and CEO, Frontier Communications; and Tom Saporito, Chairman and CEO, RHR International. “Bob is a visionary and innovator who consistently delivers terrific performance across a diverse portfolio of businesses,” Dan Glaser said. For the full interview of Bob Iger by JP Donlon, click here. 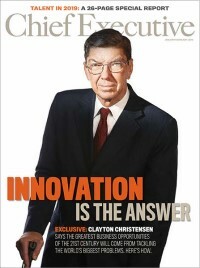 Chief Executive Groupproduces Chief Executive magazine (published since 1977), and chiefexecutive.net, including e-newsletters and online content, as well as conferences and roundtables that enable top corporate officers to discuss key subjects and share their experiences within a community of peers. The Group also facilitates the annual “CEO of the Year,” a prestigious honor bestowed upon an outstanding corporate leader, nominated and selected by a group of peers. Visit www.chiefexecutive.net for more information.